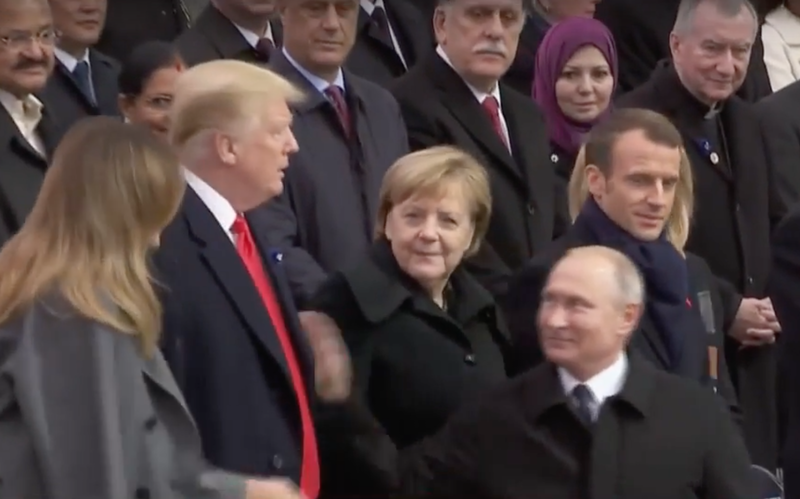 During the remembrance ceremonies marking the Centenary of the end of WWI today in Paris, the interaction between Donald Trump and Vladimir Putin was noteworthy. 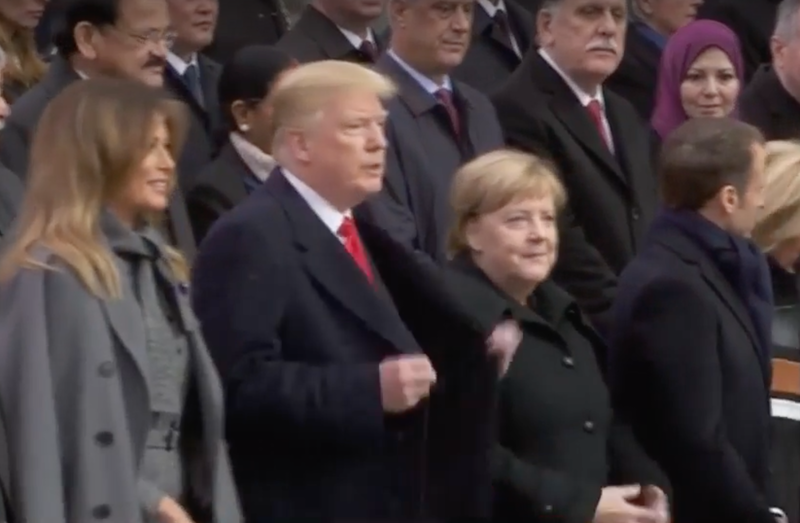 Many people have speculated regarding the significance of President Trump's jacket adjustment after shaking hands with President Putin. This is a common alpha-upregulatory behavior. Alpha upregulators are a set of body language behaviors displayed by individuals who normally may be moderately or even highly alpha personalities - when they're caught in the midst of a relatively beta moment. This is exactly what's occurring here. Although he's normally alpha, Donald Trump feels he's beta to Vladimir Putin's alpha status. It's important to emphasize that this is Trump's perception - and this is why he feels the need to upregulate. Yet while Trump's psyche attempts to dial itself up, Putin is already walking away to his seat. This is literally the same behavior of a beta gorilla halfheartedly pounding his chest - after the alpha male gorilla has already established his dominance. Now, let's back up a bit. Just as Putin finishes shaking Trump's hand, he's trying hard to suppress his mouth smile. 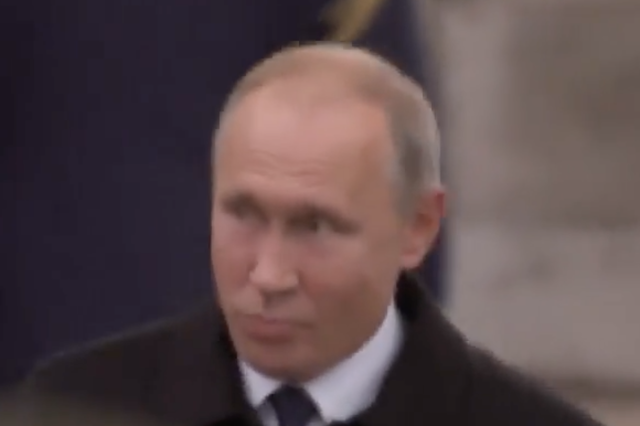 This is not a sincere smile - and in Putin's efforts to suppress it, along with his tightened mustache region, his eyelids are opened very wide as his eyebrows also elevate. 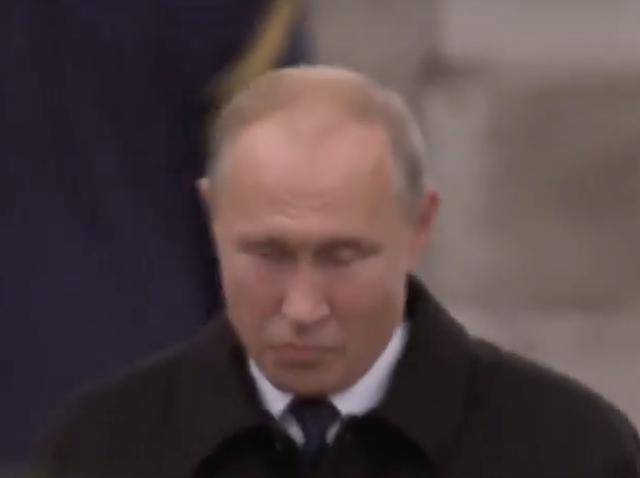 Putin, an ex-KGB officer, in this moment, cannot maintain a poker face (a skill at which he's quite accomplished and otherwise routinely successful). This is profound. 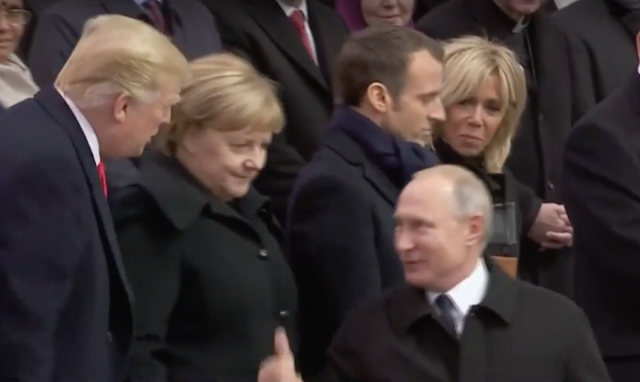 Putin then gives Trump the Thumbs-up gesture. This universal nonverbal signal of optimism very much matches his facial expression. 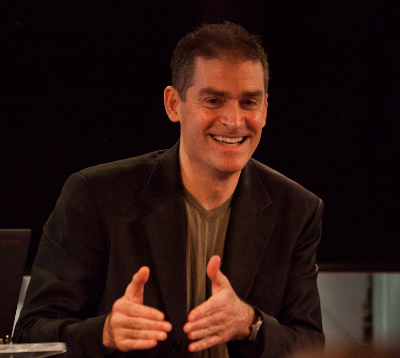 Note how his forehead has now relaxed, his eyebrows are also lowered and he has concave-up furrows in his lower eyelids (all requirements for a sincere smile). His mouth smile, while still somewhat suppressed, has broken through the thin facade. Putin is pleased. 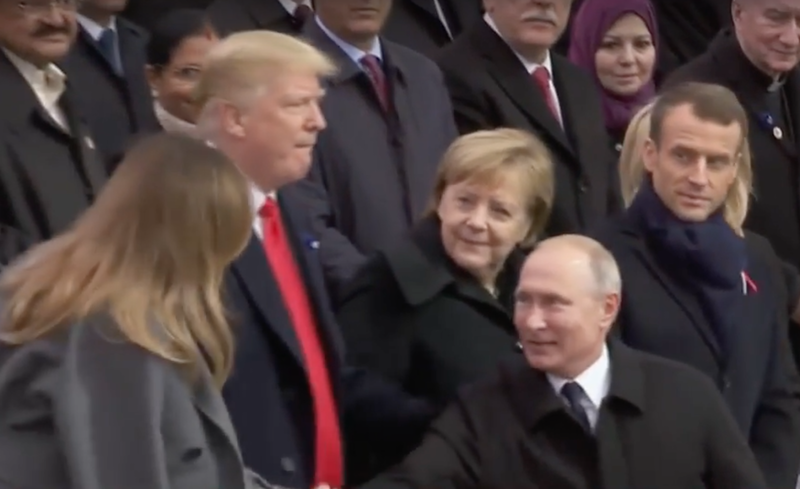 As Vladimir reaches to shake Melania's hand (whilst still smiling), Trump pats Putin on the back. Note Trump's Jaw Retraction - along with an Inward Lip Roll. In this context, this nonverbal cluster indicates an effort to suppress strong emotions. Notice Emmanuel Macron's expression in this instant - it's one of contempt (a slight snarl-like configuration). 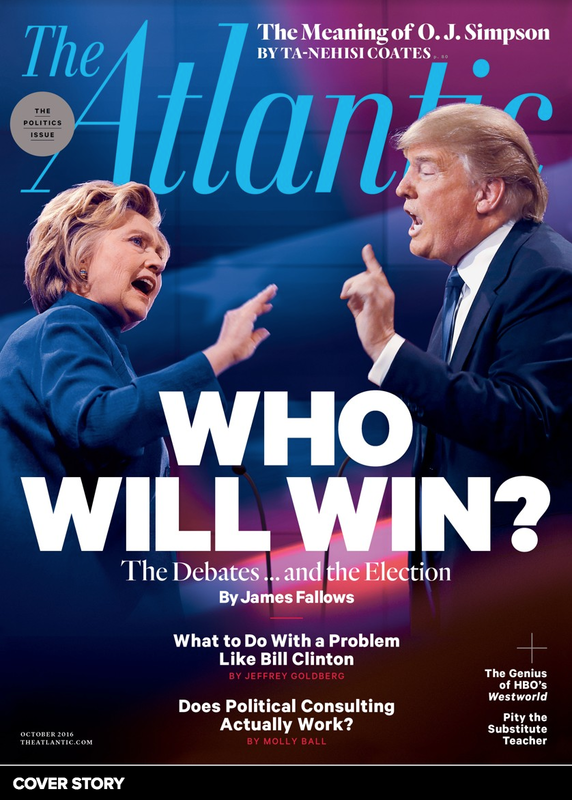 Trump maintains this jaw retraction as he stands back up. Macron's expression of contempt continues - combined with his right forehead elevating in disbelief. Angela Merkel's central forehead is elevated along with a pseudo-smile, indicating her disgust and incredulity. Putin then pats Trump on his left arm - just above his elbow. 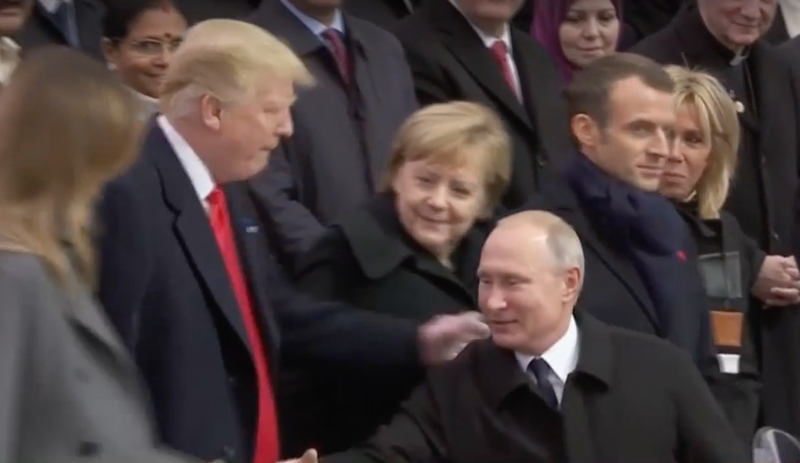 It's important to note that Putin did not touch Macron or Merkel in this manner. But if we look back even further - at a few crucial seconds -just as Putin was approaching the other leaders, we see a display of his which was omitted in the first video. Please watch just a few seconds - beginning at the 1:37:45 mark - of this second, comprehensive video. As Putin approaches - walking closer to the other heads-of-state, he shows us a classic Tongue-In-Cheek display. In this context - clustered with the other simultaneous nonverbal signals (e.g., his elevated central forehead), Putin's tongue-in-cheek behavior telegraphs his smug feelings of "I just won", "I gotcha". 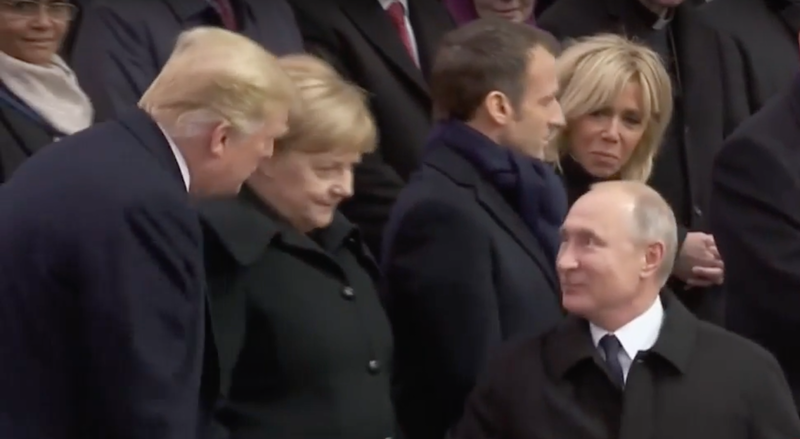 SUMMARY: Donald Trump's nonverbal behavior in Paris today, indicates he feels that he is beta to Vladimir Putin's alpha. The American president clearly doth acquiesce. Moreover, Putin cannot contain his sincere emotions of joy-happiness with his dominance over Trump - and by extension, the United States.